There are definite links between smoking tobacco and several major health problems. While we’re all familiar with its relationship to cancer or heart disease, smoking can also adversely affect your dental health, particularly the long-term survival of dental implants. Smoking can affect your mouth in two ways: first, the inhaled smoke can slowly “cook” gum tissue to form a thickened top layer of cells and damage salivary glands, which reduces saliva flow causing mouth dryness. Second, the nicotine in tobacco may cause the mouth’s blood vessels to constrict and inhibit blood flow, which can weaken the body’s defenses and healing ability. Put all these outcomes together and you increase your risk of periodontal (gum) disease that can cause the loss of supporting gum tissue and bone. Bone loss especially can have an adverse effect on implant stability, which relies on adequate bone for anchorage. Slower mouth healing caused by smoking also lowers the chances of a successful outcome to implant surgery. Over time, bone in the jaw grows and attaches to the imbedded titanium implant, which will increase the implant’s strength and durability. With a weakened healing mechanism, however, this process known as osseo-integration may fail to develop fully. As a result, the implant won’t be as strong and stable as it could be and may fail when it encounters normal biting forces. This scenario is borne out in a number of research studies. Although dental implants have a very high success rate, about 5% fail. Twice as many of those failures occurred in smokers compared to non-smokers. Although an implant isn’t destined to fail if you’re a smoker, your risks are much higher. 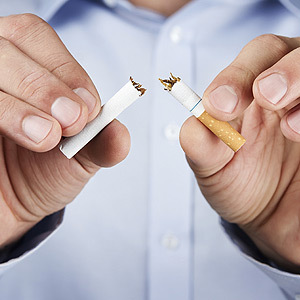 You can reduce that risk by trying to quit smoking a few weeks before implant surgery, or at the very least try not smoking a week before and two weeks after the procedure, and follow good oral hygiene practices to prevent gum disease. And, be sure to see us on a regular basis for checkups and implant maintenance. Dental implants are a highly successful tooth replacement option that can give you decades of service. Don’t allow smoking to short-circuit that success.